Crescent City WIC Services in Gretna, LA provides the USDA-funded Special Supplemental Nutrition Program for Women, Infants, and Children, or WIC for short. Crescent City WIC recently launched a fatherhood program called 504 Dads. (The area code for Gretna is 504.) They use the 24/7 Dad® program as the foundation of 504 Dads. A few weeks ago, I received an email from the staffer at Crescent City WIC in charge of the launch. She told me about their struggles to get dads enrolled in 504 Dads. She mentioned their plan to bring community organizations together to generate referrals and to help Crescent City WIC brainstorm ways to recruit dads into the program. She asked for any advice or resources NFI could provide. Cover recruitment (and retention) during training institutes on our programs. Cover recruitment (and retention) in several of our free ebooks, such as the 7 Steps to Starting a Successful Fatherhood Program. Include recruitment (and retention) as one of the five core competencies taught in our online, on-demand Father Engagement Certificate™. Help organizations assess their recruitment (and retention) efforts as part of the free Father Friendly Check-Up™. In other words, we've got a lot of resources to help you with recruitment! And, still, recruitment is as big a challenge as ever. That's why we never rest in scouring the environment for other resources and ideas. Refer back to the recruitment portion of the training institute on 24/7 Dad®. Read the recruitment ideas provided in the program's Facilitator's Manual. Read our blog posts on recruitment. But what was so helpful for me to also provide--for the first time ever and now in this blog--is this list of more than 200 recruitment ideas used and brainstormed as potential recruitment tactics by staff in organizations across Texas. Include recruitment videos on the screens of gas station pumps in neighborhoods where the dads you want to serve live. Recruit dads at prenatal clinics and hospitals (e.g. labor and delivery units). Host a workshop for family court judges, lawyers, and child support enforcement workers to generate referrals. Pass out flyers during school events (e.g. plays and sports games). Pass out flyers during cultural events associated with the demographic(s) you want to reach (e.g. Juneteenth, Cinco de Mayo, and the Chinese New Year). Partner with programs that serve moms--where there's moms, there's dads! Needless to say, the staffer at Crescent City WIC was grateful for this list of ideas. 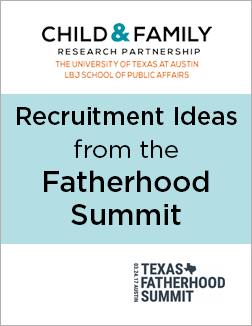 I hope you find the list of Recruitment Ideas from the Fatherhood Summit helpful in your recruitment efforts. Have you proactively sought to build a network of organizations to generate referrals? 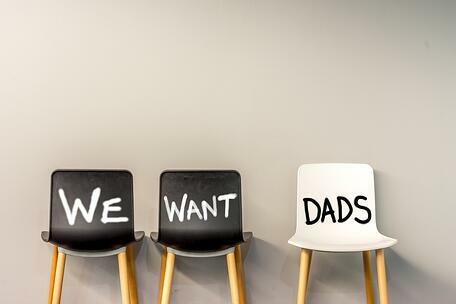 Do you measure what works and doesn't work in recruiting dads?